Thank you for your interest in raising funds for The Collective Heart! We are always looking for enthusiastic people interested in using their skills and talents with others to give those in need new opportunities. The following information and press kit will assist you in spreading the word about our Life Changing Organization. In January 2003, Kenya launched its Free Primary Education policy, enabling children who were never before able to go to school, the ability to earn an education. With this announcement however, more than 1 million new students enrolled but were met with the disappointing reality of inadequate educational infrastructure, a severe shortage of quality teachers available to teach in rural areas, and increased class sizes in crowded, dusty classrooms, compromising the quality of education received. In response to these challenges, The Collective Heart with Free The Children raised funds to build schools, teachers' offices and accommodations, and much more. The attached March 2010 progress report is provided to assist you in your campaign to raise funds for The Collective Heart. The following videos are available for your campaign. Just copy and paste the website address in your emails, newsletters, websites, and blogs. 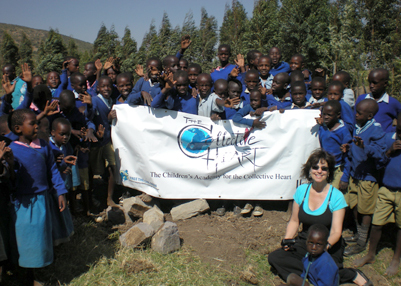 Jenny Hamel, San Diego 6 CW Reporter, traveled with Vivian Glyck to Uganda, and to The Children's Academy for the Collective Heart this year. Take a minute to see how our donations are being invested in the people of Uganda. You can use this this video in your fundraising campaign. Click on the link below to watch the video. According the the United Nations, the fastest way to eliminate worldwide poverty is to educate girls. In Uganda millions of children are out of school due to no government support.